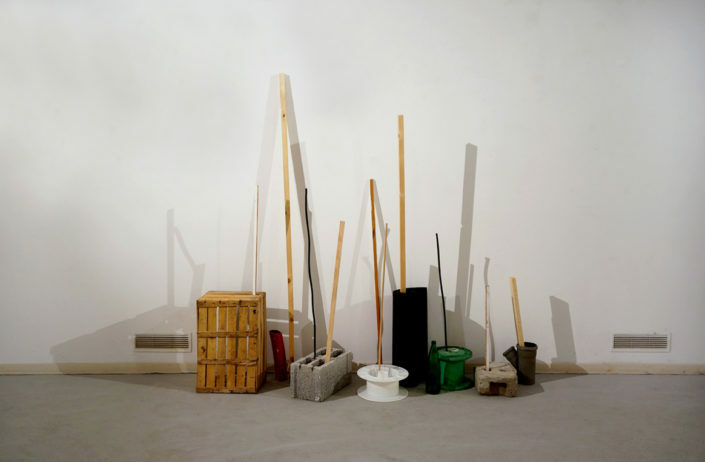 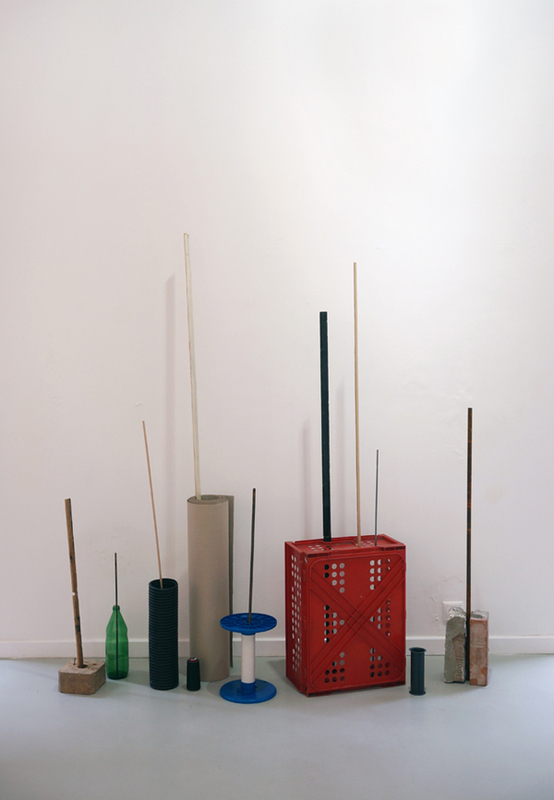 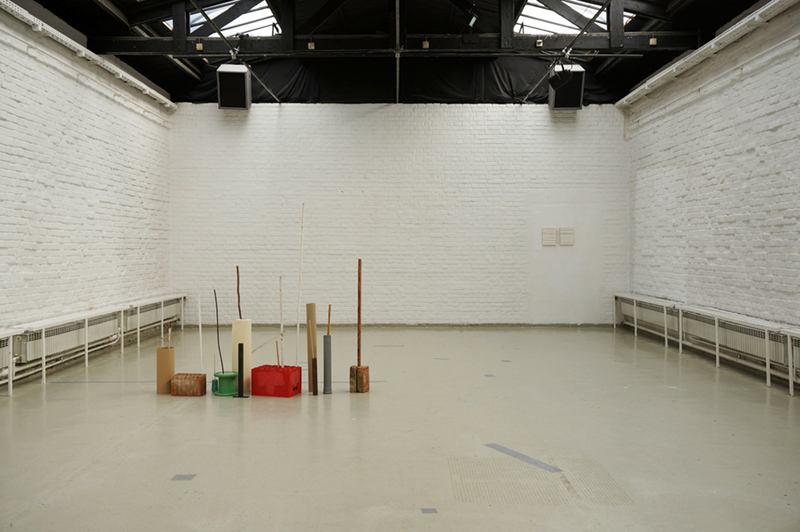 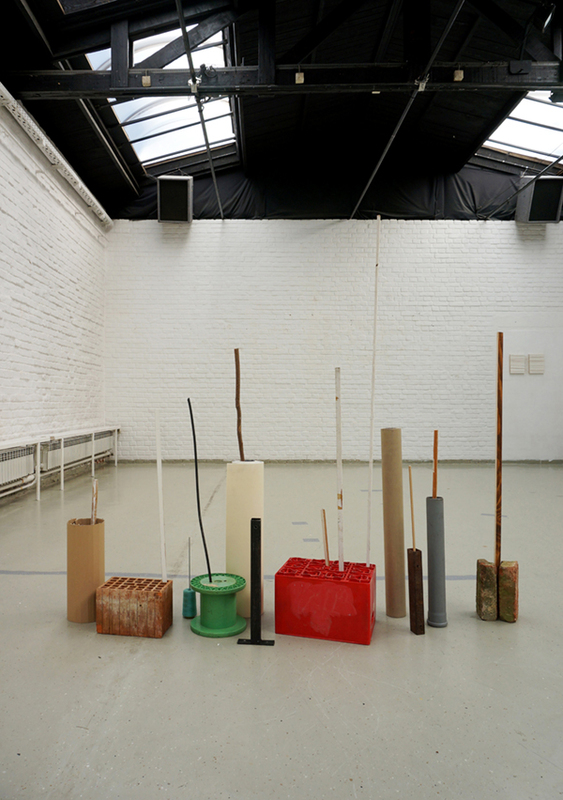 In Assembly Line, Horvat makes an arrangement of found materials – sticks, bricks, cardboard tubes, plastic crates – to crudely indicate/enact a line or division in the space – at once a fence and a line of crude humanoid or almost human figures. 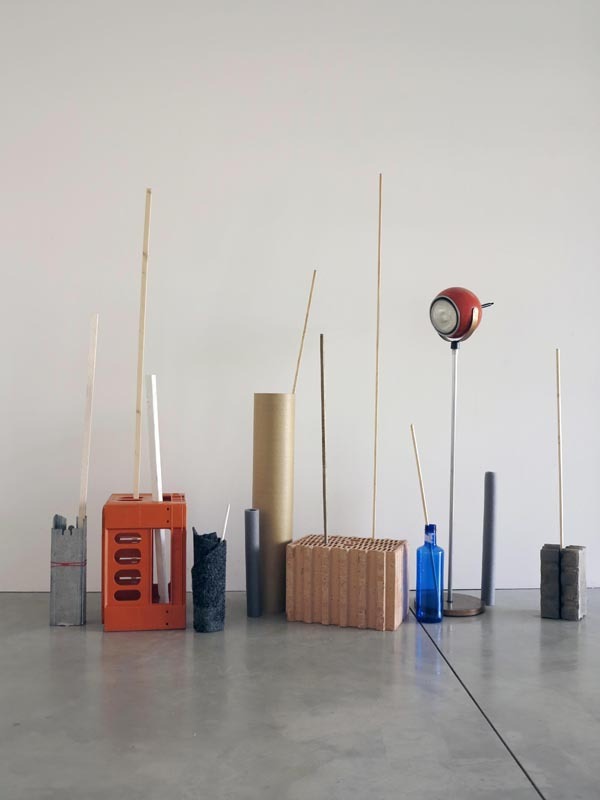 Assembly Line makes play with the relation of human and object, making an optical play around the line of scrap / discarded materials and the temporary appearance or ghosting of a set of human figures. 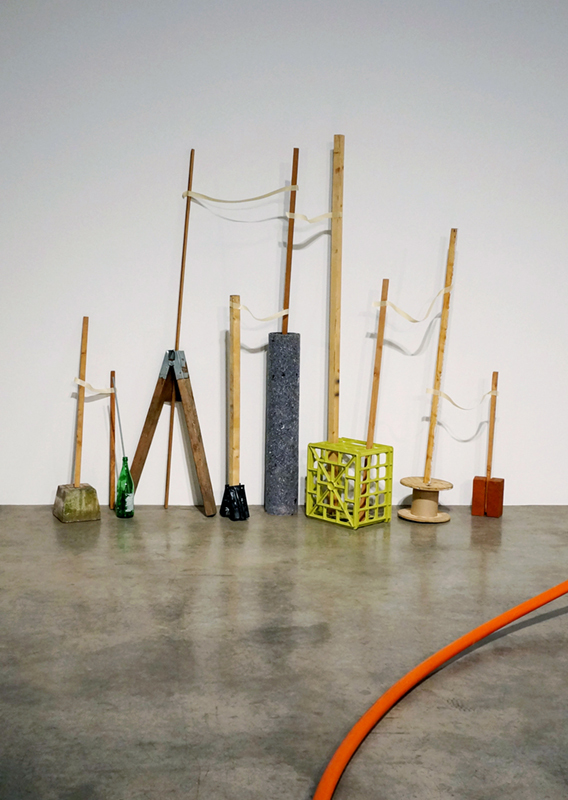 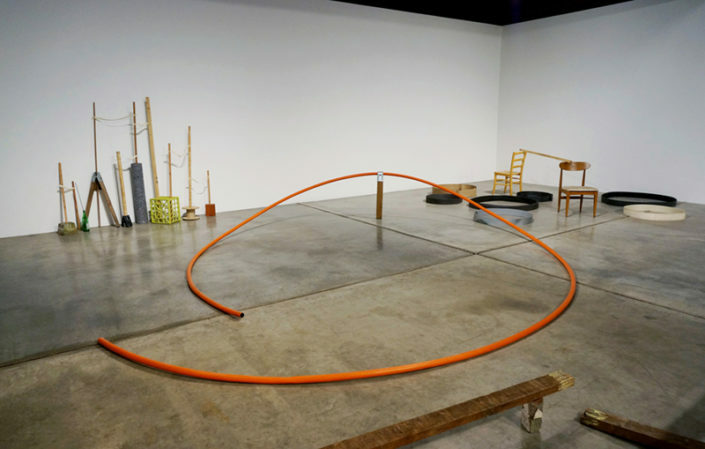 The arrangement/materials used in the work are simple, with an apparently homemade and casual aesthetic, but the possibility of presence they summon is complex and multilayered, offering powerful evocation of things both abstract and narratively suggestive or readable. 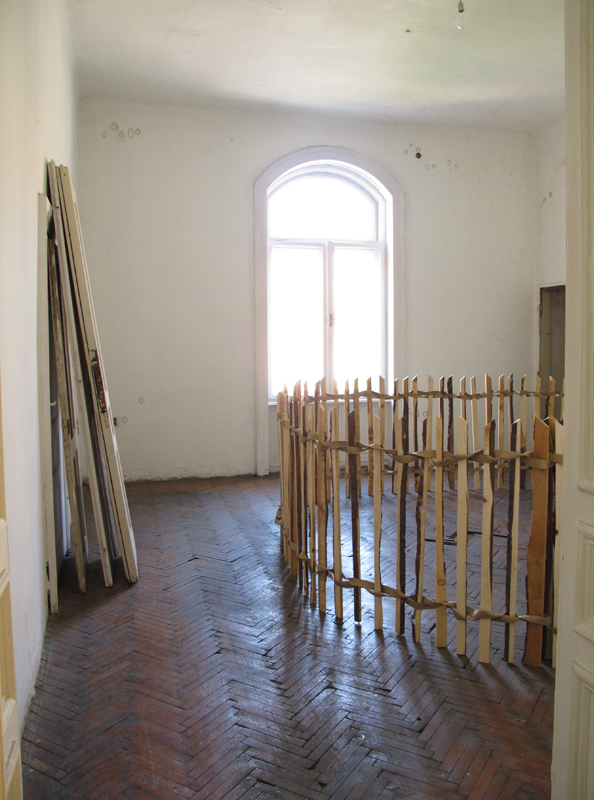 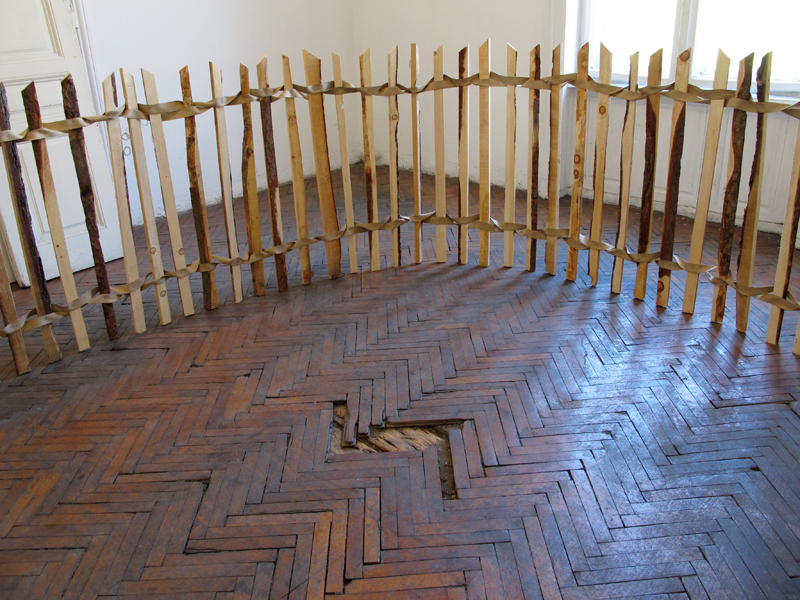 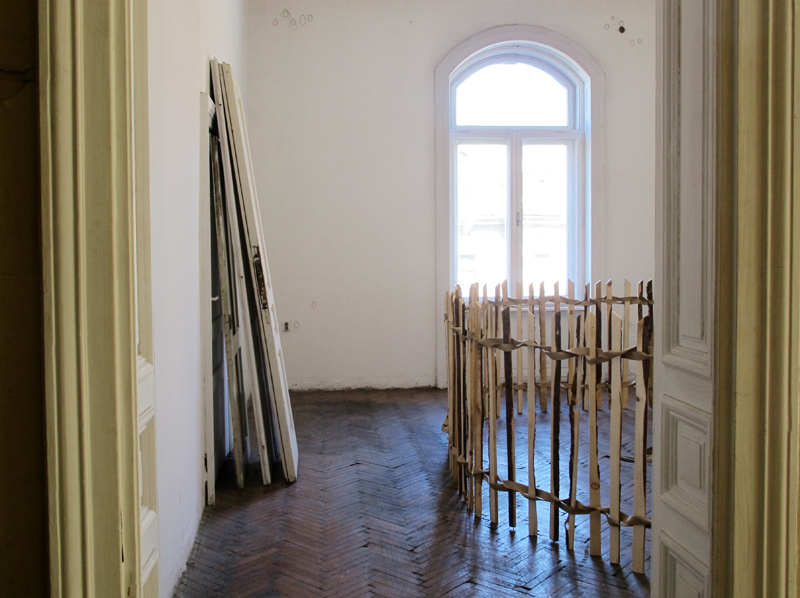 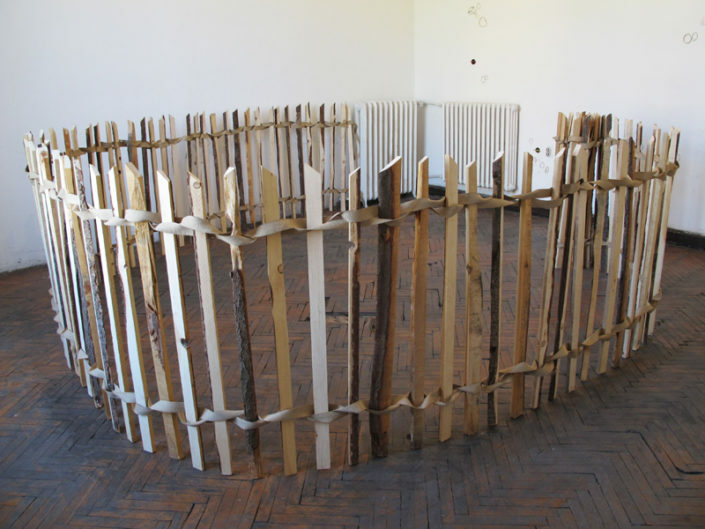 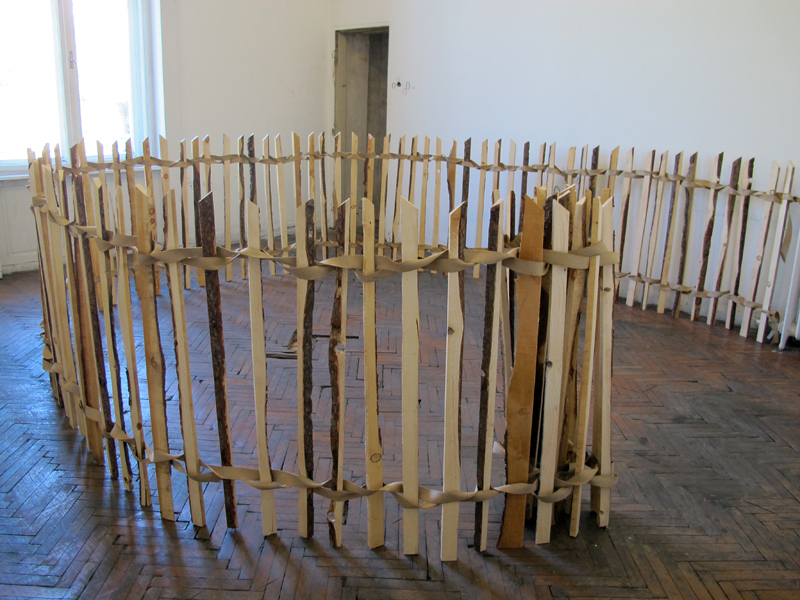 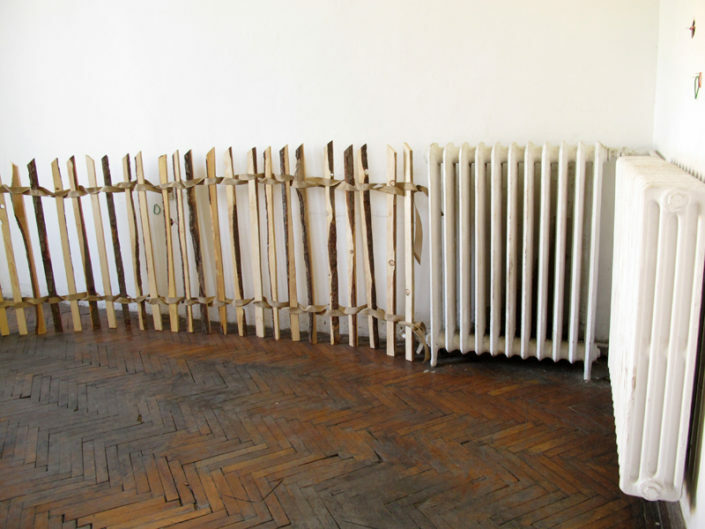 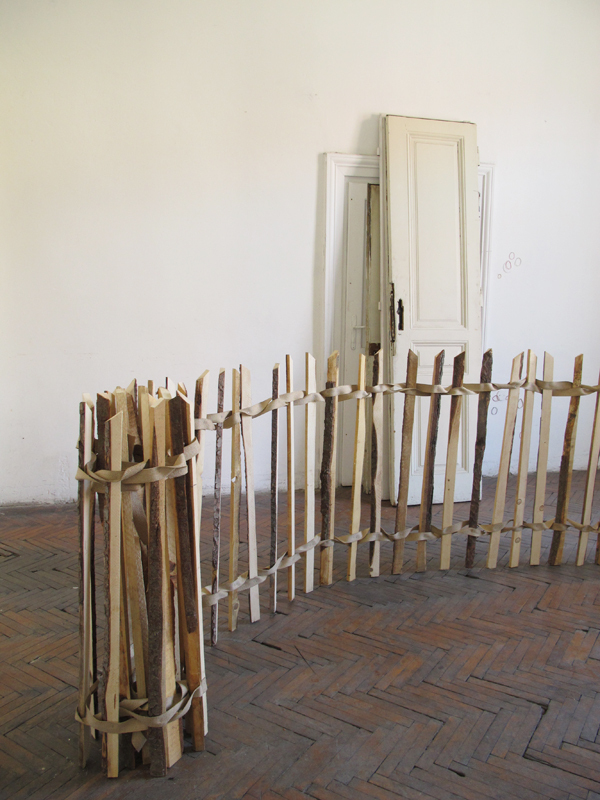 Starting from the radiators in the corner of the room and continuing out into the central space, a makeshift crudely constructed fence curves around the area in the floor where some parquet slats are missing, creating an appearance that this hole in the floor has been cordoned off. 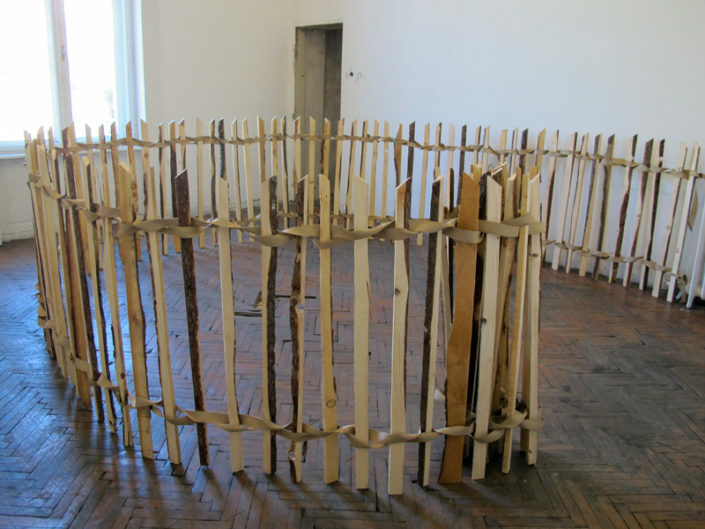 Evoking strategies of protection of space, prevention of injury, and more generally, regulation of access into an area deemed “un-enterable”, this unfinished, and in places unstable and collapsing, fence structure enacts provisional spatial segmentation, speaking to the temporary nature of organized/divided space, its impermanence and porousness. The gesture of sectioning off a previously existing hole in the floor’s surface with an intervention whose scale is bigger than the scale of the apparent “problem,” invokes the possibilities and problematics of spatial organization – affecting use of space and its navigation. 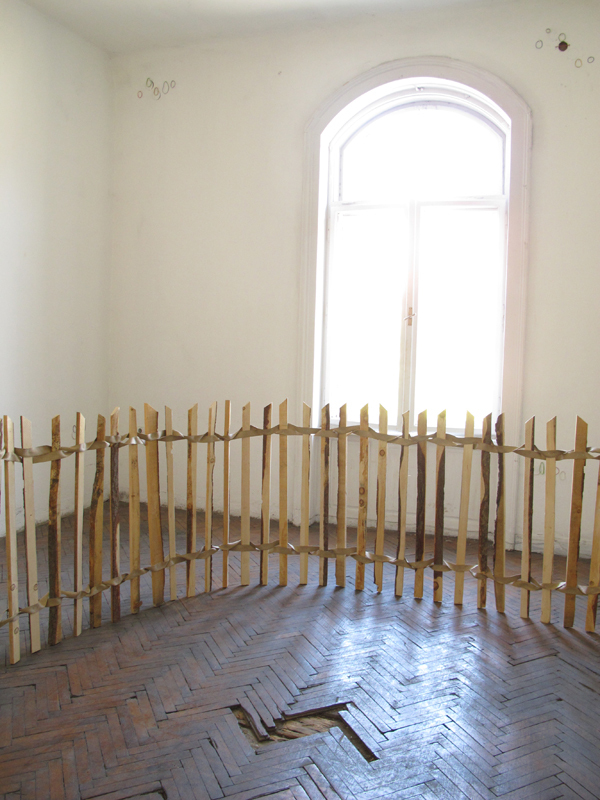 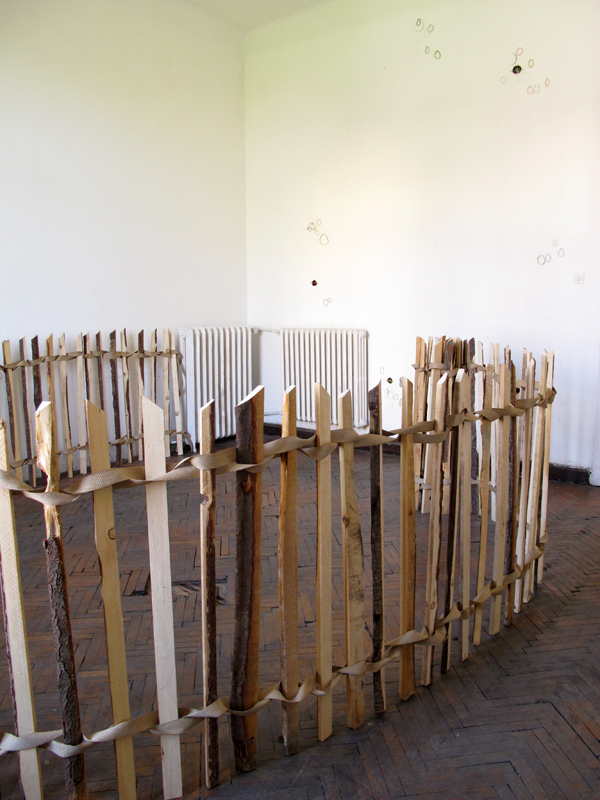 A kind of a parasitic presence in the room, the incomplete fence – which here additionally misrecognizes and incorporates the radiator into its structure – is performing the role of a space divider, as well as an obstacle course, altering both the physical space and the visitors’ movement in it, sending them onto a maze-like path and into a semi-circular spin in the centre of the room.